Two-time U.S. Olympic team gold medalist and FEI World Cup Final winner Beezie Madden recently announced the retirement of her 2016 Rio Olympic Games partner, Cortes ‘C.’ When he returns from their Florida base, “Tiny” will join Madden’s herd of retired top show jumping mounts at her and John Madden’s farm in Cazenovia, N.Y.
“He’s just such a great horse to have around—he loves people and has a great personality,” Madden said. While Madden won’t have her buddy on the competition trail with her anymore, she can rest assured he’s getting a well-deserved retirement at her home base. Tiny will join Beezie’s other past champions like Authentic, Coral Reef Via Volo, Mademoiselle, Cloud Nine, Capri, Prima, Victoria and more, who all live out in the fields 24/7 at the farm. 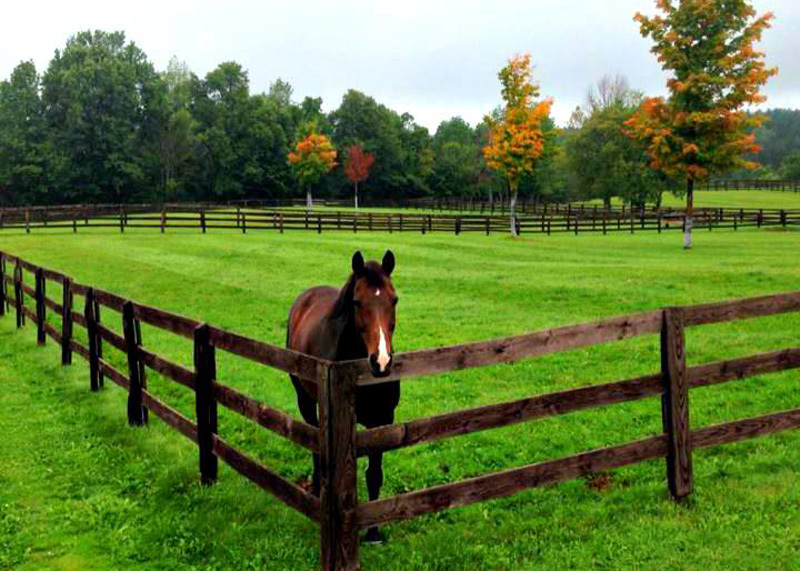 Cloud Nine enjoying retirement at John Madden Sales Inc. Photo courtesy of John Madden Sales Inc. The horses all have access to run-in sheds in their fields, but life as a retiree at the Maddens’ farm is all about just that: being a horse. 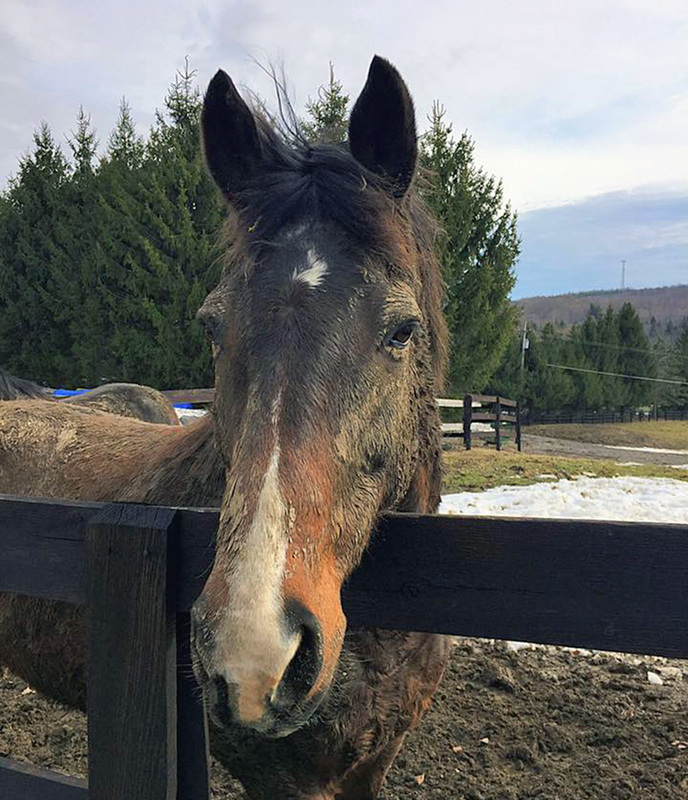 The Maddens’ mentality is these horses have spent most of their lives turned out to the nines—feet painted, manes braided, coats meticulously groomed and polished—so in their later years, they’ve earned a good roll in the mud. He won three Olympic medals in his career, but now Authentic revels in a good roll in the mud. Photo courtesy of John Madden Sales Inc.
“Most of them are barefoot, they’re fuzzy, they have long manes going on. You wouldn’t necessarily recognize Capri or Mademoiselle—I’d have to point out which one is which because they look a little different—but they love it,” Maloney said. 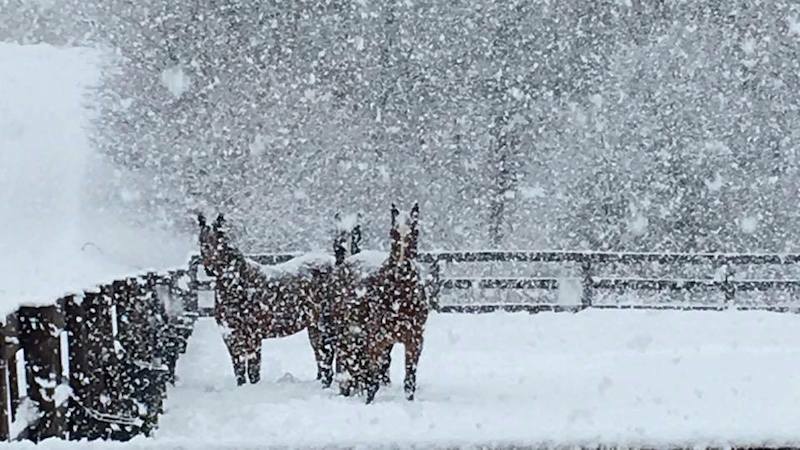 The retirees at the Maddens’ Cazenovia, N.Y., farm live like horses, turned out 24/7 no matter the weather. Photo courtesy of John Madden Sales Inc. In the last year the Maddens have purchased an additional 100 acres for more turnout for their retirees and to build a massive retirement barn. The barn is essentially laid out like an indoor arena crossed with a very sophisticated run-in shed. It’s attached to several turn-out fields and divided inside into several sections to keep the turn-out groups separate. 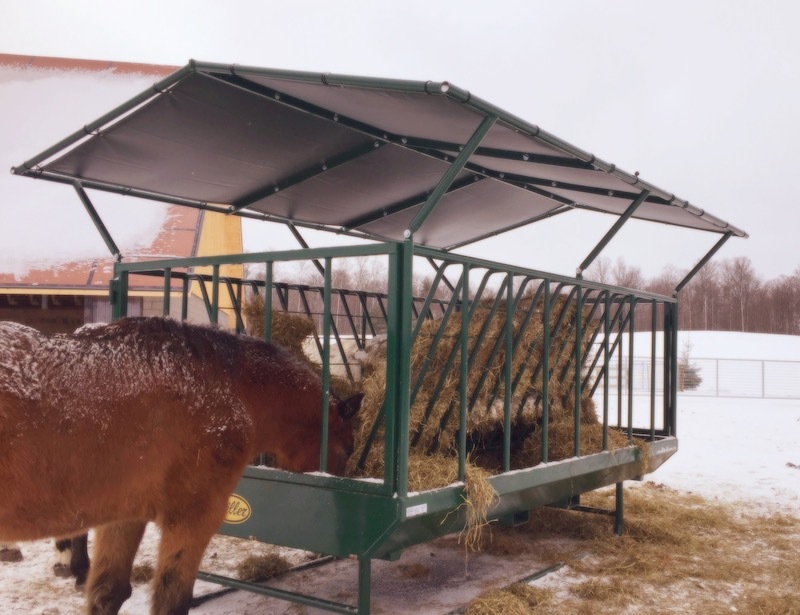 There is an aisle down the center divided similarly to stanchion stalls for dairy cows—hay gets rolled out into the aisle, and horses from both sides can eat through slots. Straw is strewn inside the barn for horses to come inside and lie down on. The center aisle of the retiree barn—geldings to the left, mares to the right. 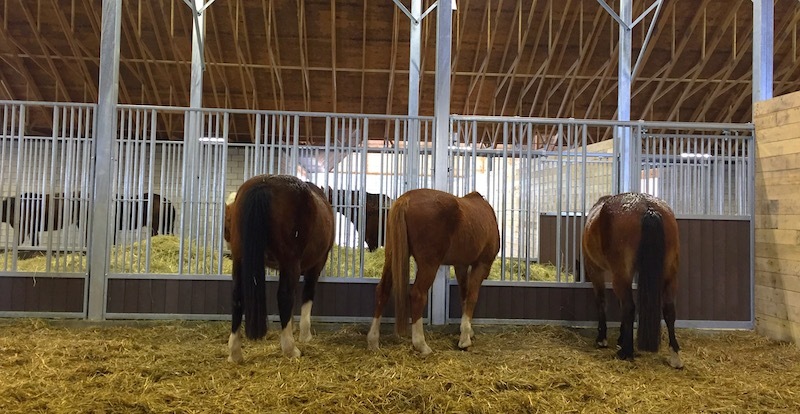 Photo courtesy of John Madden Sales Inc.
View from the back of retired geldings eating. Their run-in area is bedded in straw. Photo courtesy of John Madden Sales Inc. 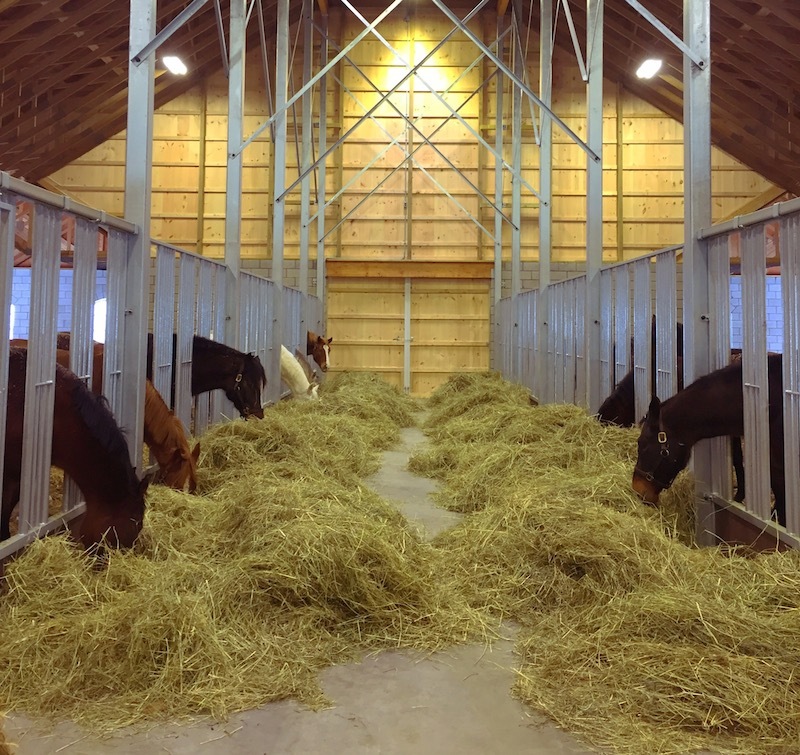 The retirement barn has a maximum capacity of 60 horses and currently houses 26. 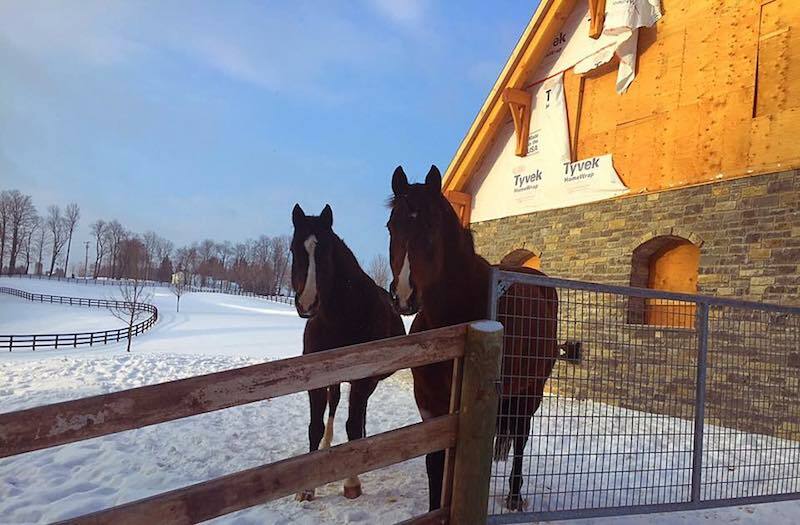 In the winter, Maloney said the horses are grained twice a day, but in the warmer months they are rotated through large grass turn-out field with run-in sheds and get just a handful of grain once a day. 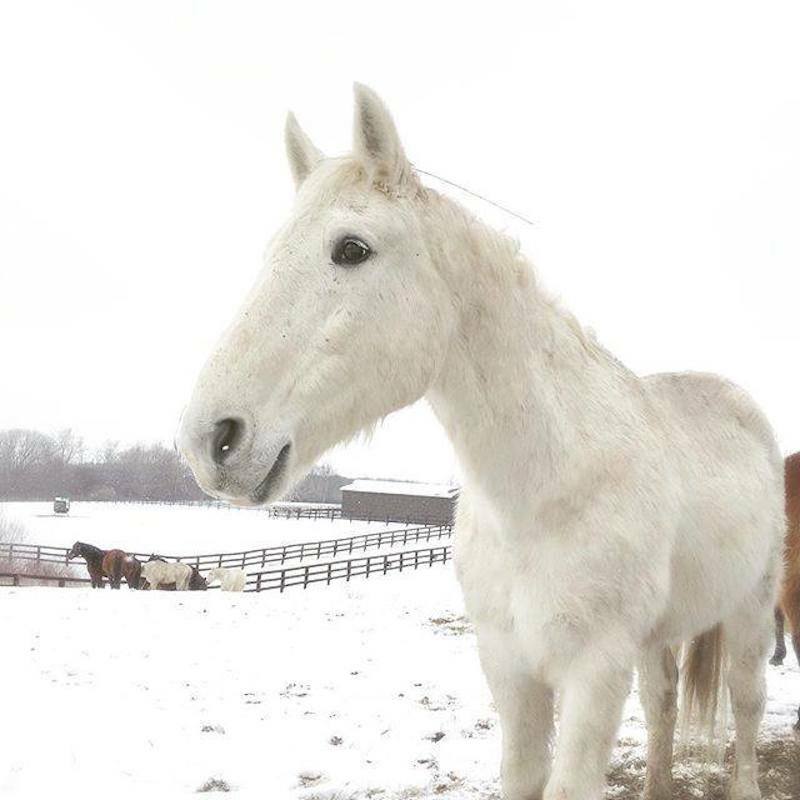 Unless a specific condition calls for it, none of the horses are blanketed or wear fly masks—fuzzy coats and swishing tails take care of the elements. 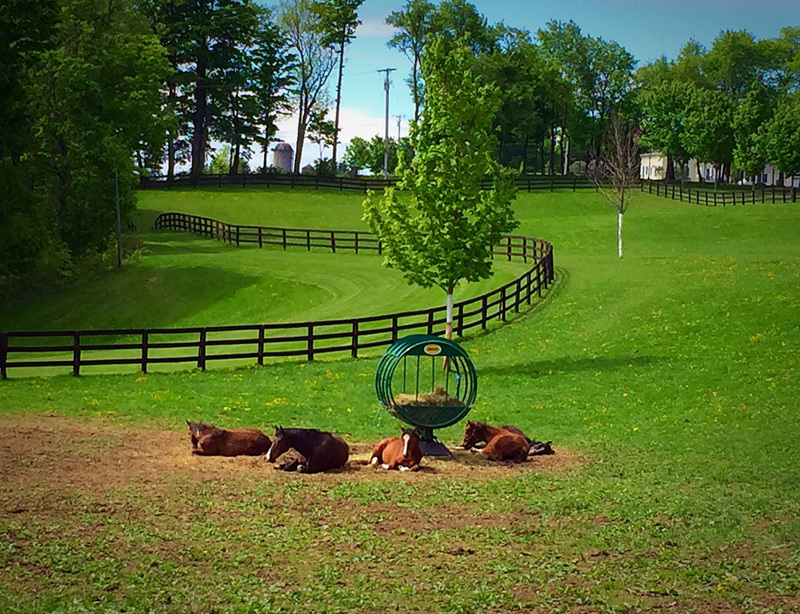 The herds of retirees also have outside hay feeders. Photo courtesy of John Madden Sales Inc.
You’d think one massive retirement barn would be sufficient for the Maddens’ herd, but Beezie has hopes to build another retirement barn in the front of the property where perhaps the most famous retiree, Authentic, or “Bud,” is housed in a special field. Authentic in his field of honor. Photo courtesy of John Madden Sales Inc.
Authentic’s career with Beezie included team gold medals at the 2004 and ’08 Olympic Games, team and individual silver medals at the 2006 World Equestrian Games (Germany) and the individual bronze medal from the 2008 Olympic Games in Hong Kong. Bud, now 22, officially retired in 2013. “Bud is sort of a tour destination stop, so he’s got the front prime location so he can have his photo ops. He loves visitors,” Maloney said. Bud also babysits the Maddens’ young horses when they are weaned, and for the past few months Beezie’s 2012 London Olympic Games mount Coral Reef Via Volo has also been turned out with him, as she is expected to foal this spring. Authentic and Coral Reef Via Volo with their new “shed,” which is more like a little horse mansion. Photo courtesy of John Madden Sales Inc. Stories of former top horses ending up in tough spots as retirees are not uncommon in the horse industry—champion thoroughbred Ferdinand, who won the Kentucky Derby in 1986, was killed at the age of 17 in a slaughterhouse in Japan after failing as a stud. The Chronicle reported on how grand prix rider Schuyler Riley discovered her former Nations Cup mount Gracia ended up being sold as an underweight 26-year-old through a Craigslist ad. It’s that sort of fate the Maddens avoid by retiring all their horses at their own farm, and Maloney says they retire horses for other riders and owners on the circuit who want a similarly safe and steady retirement for their former mounts. Authentic (second from left) babysitting the yearlings in his field. Photo courtesy of John Madden Sales Inc.